Joe Wright is the director who gave us Atonement and Pride and Prejudice, two films of vast stylistic and narrative difference to his latest film, a fairytale, spy/chase movie mash up named Hanna. Starring Saoirse Ronan in the titular role, Hanna focuses on a young girl who has been raised by her father (Played by Eric Bana) in the woods as a girl who can hunt, fluently speak multiple languages and engage in hand to hand combat. The reason for this intense training becomes clear as Hanna is instructed to kill Marissa Wiegler (Played by Cate Blanchett) however Hanna does not know that Marissa wants Hanna dead and that her past may be more mysterious than she imagined. Hanna is by far Joe Wright’s most exciting and visually inventive film to date. The star of Hanna is undoubtedly Saoirse Ronan who gives the best leading actress performance of the year so far. As Hanna she is able to perfectly pull off the mix between dangerous super warrior and vulnerable little girl while also being able to effectively portray a wide range of challenging emotions. She is thoroughly convincing in every aspect of the role of Hanna and dominates every scene she is in. This girl is a star in the making and Hanna is further proof of that fact. In terms of the supporting cast only one actor truly stands out and that is the superb Tom Hollander. As the short shorts, tracksuit wearing, whistling henchman sent out to find Hanna he fills the screen with a presence that is both comedic and intimidating. Cate Blanchett’s role is rather one note with her strong Texan accent and appearance making her much more of a pantomime villain than a threatening and mutli layered character however due to the fairytale nature of the narrative she was clearly the embodiment of the evil queen and was not meant to carry any more depth than that. Hanna is a film that has many distinct elements to it. Part of it is a chase movie, where in the middle there is a brief yet effective interlude where Hanna meets up with a surprisingly funny English family and the film becomes a coming of age drama/comedy. It is in these moments where the film is at its most comedic and most relatable to the audience. A spy conspiracy element is tacked on late in the films narrative with a connection to Hanna’s past which feels more like something created at the spare of the moment to explain away certain elements of the narrative and it is never explored in much depth. While Hanna succeeds with its leading performance and its comedic moments, the films finest technical achievement and most exciting moments all come from the films action and chase sequences. This is where Joe Wright becomes an exciting presence behind the camera and uses techniques, which stylizes and compliments the action sequences. Like Atonement he uses the one long take, this time for the purposes of an Eric Bana underground punch up. This scene is incredibly well done and the one long take serves to build up the tension making it feel visually connected to the story rather than just for the sake of it. A chase through a container park is also visually exciting with all the action scenes being exciting and clear to see what is happening and to whom, which makes a nice change of pace from all the frenetic editing we see in a lot of action films nowadays. A big reason why the action sequences work so well is down to the original score from The Chemical Brothers, which is easily my favourite score of the year so far. Every time the action scenes start this techno beat kicks in which gets you immediately engaged and excited. This, like Daft Punk’s score in Tron Legacy is a score that I will be listening to multiple times due to the addicting nature of some of the tunes. It is not just the action sequences that Wright is able to pull off but also the fairytale imagery, with a theme park towards the end of the film being beautiful yet oddly haunting in its design and look. The circular nature of the beginning and end of the film put a nice wrap on things and despite a rather open ended conclusion you still feel satisfied with the way Hanna has played and concluded. While there are many holes in the plot if you wish to investigate them and Eric Bana may not be given as much to do as he could, Hanna is such an exciting and engaging ride while you are watching that you do not notice these things and you go along with the narrative due to a combination of a fantastic lead performance, an interesting story which keeps an element of mystery for a large portion of its narrative, inventive and exciting direction and a thumping score. Ultimately Hanna achieves what it sets out to do better than any film I have seen so far this year. 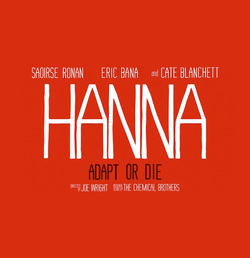 Great action scenes, visual invention, a superb lead performance and a great score from The Chemical Brothers make Hanna one of the most satisfying and exciting films of the year.